This month, our ‘Paws to Protect’ topic is focusing on fleas and ticks. So, we wanted to kick off our blog this month with a case study of a dog who developed a tick-borne disease called Ehrlichiosis. Age: Lucy is now 10 years old; she was 5 years old when the symptoms occurred. History: Lucy was examined at Lawndale Veterinary Hospital by Dr. Jelovich on February 8, 2013 for a shifting leg lameness and lethargy over the past few weeks. Physical Exam Findings: Lucy’s physical exam was mostly unremarkable, except she had a mild temperature elevation of 103.1 (normal is 100.5 to 102.5 degrees Fahrenheit) and mild crepitus (crackling) in her left wrist area. Diagnostic Findings: A 4DX test showed Lucy was positive for exposure to Ehrlichia. A complete blood count (CBC) also showed her total white blood cell count was decreased. Initial Treatment: Lucy was prescribed a 4-week course of doxycycline (an antibiotic that is effective against many tick-borne diseases) and pain medication. Follow-Up Examination / Diagnostic Findings: Over the next several days, Lucy did not improve. When her right elbow seemed to be swelling on February 10, 2013, she was taken to the emergency clinic where x-rays were taken (no abnormalities were noted). Dr. Waterman re-evaluated the swelling on February 12, 2013. The right elbow was more swollen and painful, and joint effusion was noted. Dr. Waterman suspected the symptoms were related to the Ehrlichia infection and Lucy was started on prednisone to treat the joint swelling (the doxycycline was also continued). Lucy initially improved over the next couple of weeks, but as the prednisone dose was tapered the elbow pain returned. She also developed stiffness and discomfort in multiple legs. At this point, Lucy was referred to North Carolina State University College of Veterinary Medicine (NCSU CVM) to see an internal medicine specialist. Lucy was evaluated on March 5, 2013 at NCSU CVM. She had developed swelling in her wrist and ankle joints. Joint taps revealed the presence of joint inflammation, and Lucy was diagnosed with secondary immune mediated polyarthritis (thought to have been triggered by the Ehrlichia infection). The treatment plan consisted of continuing the doxycycline and prednisone, and a second immunosuppressive drug called leflunomide was added. Over the next several months Lucy continued to be monitored at Lawndale Veterinary Hospital and NCSU CVM. Due to some liver value elevations, the leflunomide was discontinued. By September 2013 Lucy was doing well and the prednisone was being weaned to a very low dose. Lucy’s lameness returned however, so her prednisone dose was again increased and she was placed on a second new immunosuppressant – cyclosporine. 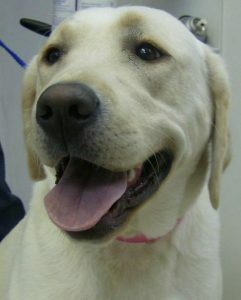 Lucy’s owners were very diligent with Lucy’s treatment and care. It actually took a couple of years before Lucy could finally be completely weaned off the immunosuppressive medications. Thankfully, she has not had a return of the polyarthritis. Lucy takes Nexgard once monthly to minimize the chances of her developing another tick-borne illness. Ehrlichiosis is a rickettsial disease that is transmitted by ticks. There are at least six known species of Ehrlichia. The species that more commonly infect dogs include Ehrlichia canis (transmitted by the brown dog tick), and Ehrlichia ewingii (transmitted by the lone star tick). Some Ehrlichia species (especially E. ewingii and E. chaffeensis) are zoonotic (which means they can infect people too). Different species of Ehrlichia can cause different problems in the body. Ehrlichia species can infect the white blood cell lines. While some dogs may clear this infection without a problem, others may develop acute and/or chronic symptoms and conditions. Symptoms of Ehrlichiosis might include lack of energy or lethargy, decreased appetite, shifting leg lameness and joint pain, fever, bruising, nose bleeds, and eye/nose discharge. A diagnosis of Ehrlichia is based on a combination of clinical signs and laboratory test results. The 4DX test checks for whether an animal has been exposed to two species of Ehrlichia. A positive result has to also be interpreted in light of clinical signs and the presence of other laboratory abnormalities. Since Lucy had a shifting leg lameness and her white blood cell count was decreased, it was determined that her positive 4DX result likely indicated an active Ehrlichia infection. In Lucy’s case, her lameness and joint swelling continued and worsened. Joint taps revealed joint inflammation. Given Lucy’s symptoms and active Ehrlichia infection, the determination was made that she had also developed immune mediated polyarthritis secondary to the Ehrlichia infection. When the immune system responds to something foreign (an antigen), the immune system will produce antibodies that bind to the antigens. Sometimes (but not always), these antigen-antibody complexes can end up in the joints of a patient. This leads to pain, inflammation, and joint swelling. This type of polyarthritis is known as secondary, because it developed in response to a “trigger”. In this case, the trigger was the Ehrlichia. For Lucy, the goals were to certainly treat the Ehrlichia infection, but she also needed medication that would stop the immune system from causing these antigen-antibody complexes from getting in the joints. Some dogs will clear tick-borne illnesses without ever showing signs. Others will present with “classic” symptoms and respond great to treatment. Sometimes, the diagnosis can be more tricky, or the symptoms may be more severe. The best things that pet owners can do for their pets is to (1) minimize the chance of a tick-borne illness by using year-round tick prevention, performing tick checks, and utilizing yard-control measures; (2) have your pet examined right away if he or she shows signs of illness; and (3) have dogs tested annually with the 4DX test that screens for exposure to some of the common tick-borne diseases. 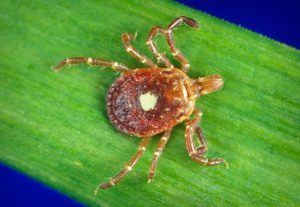 Want to learn more about tick-borne diseases? Visit our ‘Paws to Protect: Fleas and Ticks’ page!